Up to 4 passengers in a sedan taxi and up to 6 passengers in a minivan taxi ride for the price of one with just a small surcharge of $2.00 for every passenger over two passengers in one taxi. That makes our cabs much more economical than airport shuttles and you never share a ride with strangers. 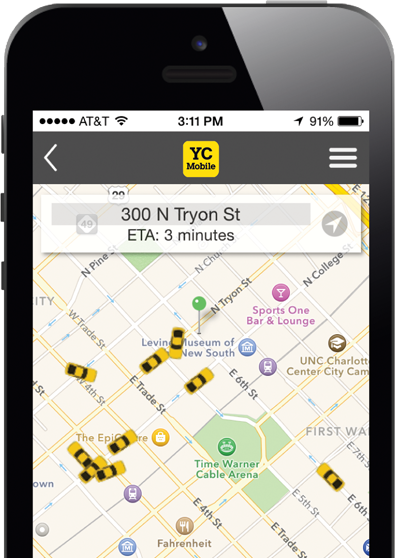 YC Mobile – Our New App!
" They are very friendly and always on time when you call them. The drivers are also very friendly too. I use this service when i need to go for long drives or if I go to a store and buy too much since I don\'t drive. " " You guys keep getting better and better!!!! Every time I need a quick and clean ride you guys are there like a knight in shiny armor. And thanks guys for not complaining about or charging me twice whenever there is a misunderstanding about picking me up. Oh yeah, FAF and Abel are so nice and sweet. Love doing business with you guys!!!! " " I have used yellow cab over 25 times in the past two years to go to the airport or other locations in the city and I\\\'ve never had a problem. They\\\'ve always been on time when I schedule a ride ahead of time and the drivers are friendly. I receive a text message when the driver is on the way and how many miles away he is and one when he arrives telling me to come outside. I\\\'ve never been scammed on my fare either. They make it very clear what their rates are in the cab and it always matches the meter when the trip is over. " If you would like to drive for the best taxi company in Charlotte, just call us at our cab offices at 704-529-1130. Come drive for the best taxi company in town. ©2019 Yellow Cab of Charlotte. All rights reserved.